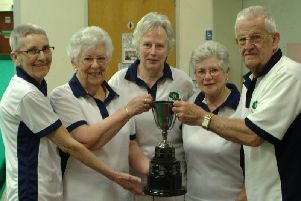 The penultimate charity gala at Rugby Thornfield Indoor Bowls Club saw a reduced field of ten teams compete in aid of Arthritis Care. Three teams were level on seven points after the first round of games Take Heart, Fanny’s Fantom Flan Flingers and X Rail with Glebe All Stars a point behind and The Odd Bunch completing the top five on four points. The midway break saw Take Heart and Fanny’s Fantom Flan Flingers still tied for top spot, X Rail dropping down to third. Nearly There was fourth, just three point off top spot and one point ahead of Red Five in fifth place. With the third set of games completed Fanny’s Fantom Flan Flingers had managed to break away to be sole leader, X Rail a point behind. Take Heart and Nearly There were joint third with Red Five clinging on to fifth. Fanny’s Fantom Flan Flingers (Nigel Malka, Trevor Pike, Colin Knapp and Nigel Hewitson) finished strongly to win the gala with 26 points, X Rail were second on 24 points and 21 points secured third place for Take Heart. The top five was completed with The Odd Bunch and Red Five on 19 and 18 points respectively. The final gala of the season is on Sunday, April 2 in aid of the Warwickshire and Northamptonshire Air Ambulance. There will be a Bowl4Free session before between noon and 2pm plus a table top sale also taking place.